As the Republicans begin to accept, albeit reluctantly, that Donald Trump is going to be their candidate and as it becomes clear that Sanders has been eliminated, the choice of possible running-mates is coming to the fore. It is pretty obvious to me that Hillary Clinton cannot chose a woman as her Vice Presidential pick. To be elected as the first woman President is already a risk. To have another woman as her running mate as well would be going over the top. She would risk alienating all the patriarchal minorities she is going to depend upon. A two-woman ticket, in the US of today, would almost certainly lose. It would be far too risky and Clinton just does not take risks. Second, and more importantly, Clinton cannot afford, and will not tolerate, another woman who takes the feminist spotlight away from herself. Clinton’s feminist credentials are rather weak. She needs the comparison when juxtaposed with a man to get up to be just passable. Any woman she chose as her VP would almost certainly have stronger feminist credentials and would hog the feminist limelight. Clinton’s ego would not, could not, intentionally allow her to accept a position in the shadow of someone else. Clinton needs to project an image of strength and resolve (which she does not naturally do). For this she requires a man as her running mate. She needs him to be perceived as being strong but subservient to her. In fact, all her closest advisors need to be men for the image of her strength to be enhanced. Not unlike how Indira Gandhi or Golda Meier or Margaret Thatcher chose in their heydays. Just as Hillary Clinton has no choice but to avoid a female running mate, Donald Trump is, I think, forced to have a woman as his. His weakest support is with women and that support is necessary. But interestingly he needs an intelligent, feminine – rather than a feminist – partner. I merely observe that “intelligent and feminine” always trumps “feminist” (no pun intended) and even overrules “attractive”. A “feminine” female never needs to fight all the battles that a feminist does. “Feminine” always makes “feminist” look envious. She will need a track record for “smartness” and pragmatism. She will therefore have to be an experienced politician but feminine enough to eclipse Hillary Clinton. She will have to be feminine enough to make the feminist attacks seem like sour grapes or just envious “whining”. Trump has a track record of appointing women to high positions in his business empire and the voters will need to be reminded of that. Ted Cruz has announced Carly Fiorina as his VP pick, but it seems a desperate bid for publicity against a rampant Trump. Fiorina herself would not qualify to be a Trump running mate. Sarah Palin’s name has been mentioned but I suspect she carries too much baggage. Condoleezza Rice has also been mentioned but she carries even more baggage. South Carolina governor Nikki Haley (nee Nimrata Nikki Randhawa and of Sikh origin) is not impossible and neither is Cathy Rodgers, a five-term Republican congresswoman. Susana Martinez is the Governor of New Mexico and in addition to being intelligent and feminine is also of Hispanic origin. Joni Kay Ernst is the junior Senator from Iowa and a combat veteran who has seen service in Iraq. My guess would be that whoever he picks, in addition to being intelligent, feminine and with a track record in politics, will also probably represent an “immigrant” constituency. 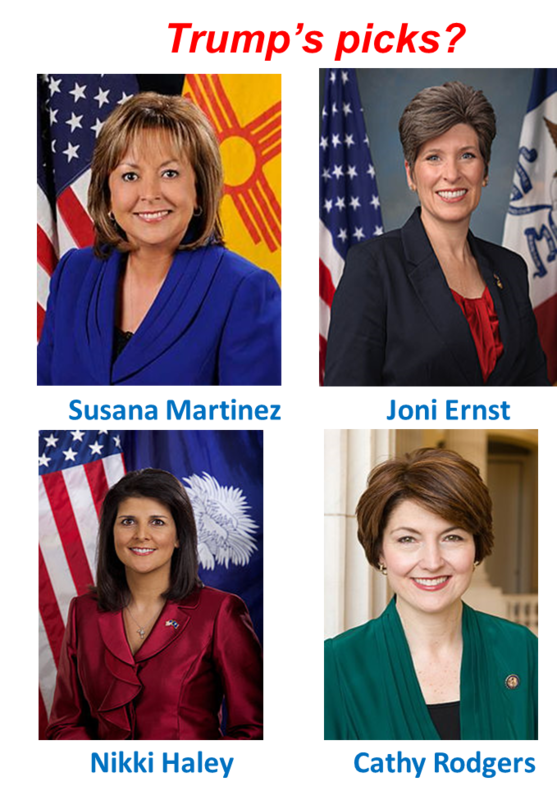 Which would take Nikki Haley and Susana Martinez to the top of the possible list. This entry was posted on April 30, 2016 at 10:03 am and is filed under Behaviour, Politics, US. You can follow any responses to this entry through the RSS 2.0 feed. Both comments and pings are currently closed.